Essential Elements of Public Speaking employs an efficient approach to help beginning students master the key skills of the effective public speaker. Author Joseph DeVito breaks the process of public speaking into 10 discrete steps and covers each step in detail to give students everything they need to prepare and present successful speeches. In addition to the latest research and updated examples, the Sixth Edition offers more in-depth coverage of how to use multimedia presentation aids, which has become an essential part of today’s public speaking. 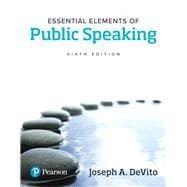 Essential Elements of Public Speaking, Sixth Edition is also available via Revel™, an interactive learning environment that enables students to read, practice, and study in one continuous experience. Joseph A. DeVito received a BA from Hunter College in 1960 (with a major in speech and a minor in Spanish), an MA from Temple University in 1962 (with a major in speech along with some sociology), and a PhD from the University of Illinois in 1964 (with a major in speech and a minor in linguistics). After receiving his PhD, DeVito returned to his alma mater, Hunter College-in-the-Bronx [which later became Lehman College], to teach. Later, he moved to Queens College and then to Hunter (from which he retired from full-time teaching)–all within the City University of New York. During his teaching career, DeVito taught a wide variety of undergraduate and graduate courses, with a concentration on the undergraduate level and mainly on the introductory courses. At various times, DeVito has served on the editorial boards of Quarterly Journal of Speech, Communication Monographs, Communication Education, Communication Quarterly, Journal of Communication, and Etc: A Review of General Semantics. He has also served as consulting editor to publishers: Random House, Harper & Row, Waveland Press, and HarperCollins. He also served as ETS coordinator of the committee to construct the DANTES Public Speaking Test for the Educational Testing Service. A prolific author, DeVito has written or edited more than 20 books in the field of communication, including The Interpersonal Communication Book, Human Communication: The Basic Course, and Essentials of Human Communication, all published by Pearson.